yum sul tang - Korean goat stew topped with dul jae - a sesame type seed - which, supposedly, according to the hand written neon paper sign on the wall, is full of omega3, improves memory, and is good for joints as well as vision? according to the neighboring canvas also displayed on the wall, the elixir, ie, goat stew, is good for circulation, pregnant women, strengthens men's stamina, strength and ... er.. virility, fight free radicals, prevent wrinkles, fights osteoporosis, cleanses liver/kidney and also improves your vision (plus other effects for a grand total of 9 health/medical properties). once the stringy pieces of goat meat hits your mouth, you too will realize: yes, the stew is almost magical. the Koreans say goat meat closely resembles dog meat in its bu properties (pardon the Mandarin usage in describing Korean values) . Also, nubile girls should not digest too much goat meat due to causal relationship between eating goat and developing a gut. tangent aside, the panchan isn't half bad: crispy, mildly spicy, not too sticky myeol chi, kimchee'd skate fish with shredded dicon, soy sauced soy beans, marinated cucumbers with octupus, etc. and a possibility that San Soo Gab Sab also serves the goat stew as well. Last edited by TonyC on August 15th, 2008, 11:41 am, edited 2 times in total. "THE MARKETING OF THE GOAT IN KOREA TG Min, KO Kong and HB Song ..."
Black goat is a big deal neutraceutically in Korea. Above pdf tells it. Think if there was a field ritual w/this stew at the first home CUBS game it would have an effect? TonyC wrote: FWIW, CH search yields: Kimchy restaurant in Nile also serving yung sul bo kum and a possibly that San Soo Gab Sab also serves the goat stew as well. Goat stew/soup is on the menu at San Soo Gab San, I had it the last time I was there. I believe it’s the same dish shown above except SSGS’s version has more broth (or would that be a different dish?). In any case I liked it a lot. I hope I’ll have a chance to compare it to the versions at Kimchy Cabana and Golden Chopsticks. I enjoyed a late night repast at SSGS last night and ordered the goat soup. 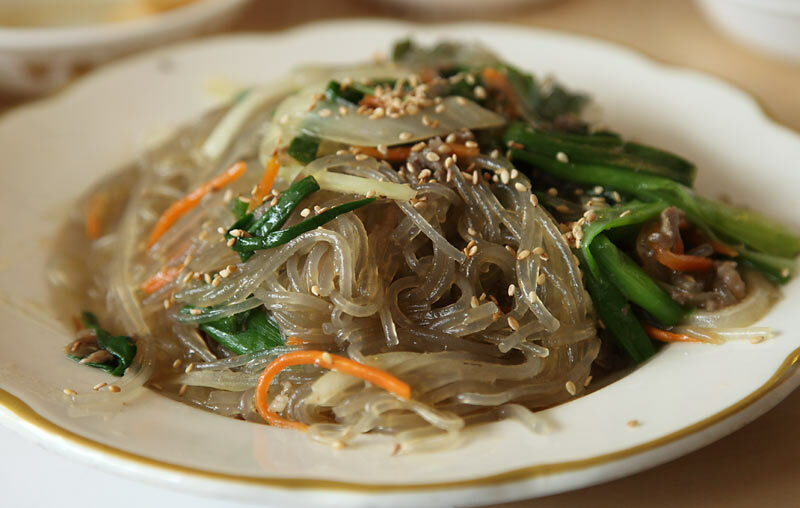 It was quite unusual, firstly because of the abundance of the "dul jae" seeds, which have very little contributing flavor in and of themselves. I suppose maybe they had been added early in the cooking of the broth as an aromatic, but having no experience with the seeds, I can only wonder if their contribution to the dish is textural or as mentioned upthread of a medicinal nature. An aromatic leafy green which I recognized as shiso or perhaps a relative added a minty bouquet which I very much favored. The broth was rather simple in its goatiness, further enhanced by rough chopped garlic. It in some ways reminded me of the more spartan versions of birria that I have tried which are not spiked with dried chillies. There was a bit of crushed red pepper sprinkled atop the soup, but for my taste was not all that spicy. The meat was abundant and good, though obviously well stewed to less flavorful state. Very interesting dish, if unexpected. 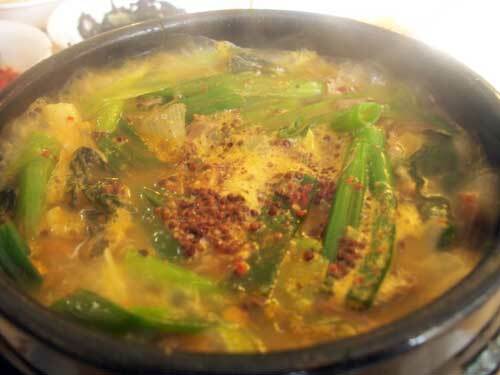 My experience with Korean stews and soups are generally of the fortified with fermented chilli paste variety, so the almost delicate nature of this soup was a surprise. My companions monkfish stew was much more characteristic of what I am more versed in. My other companion ordered spicy pork belly and kimchi, which was pungently wonderful as was the always snappy grilled baby octopus. Panchan was in abundance and rounded out a fantastic meal at 11:30 pm. 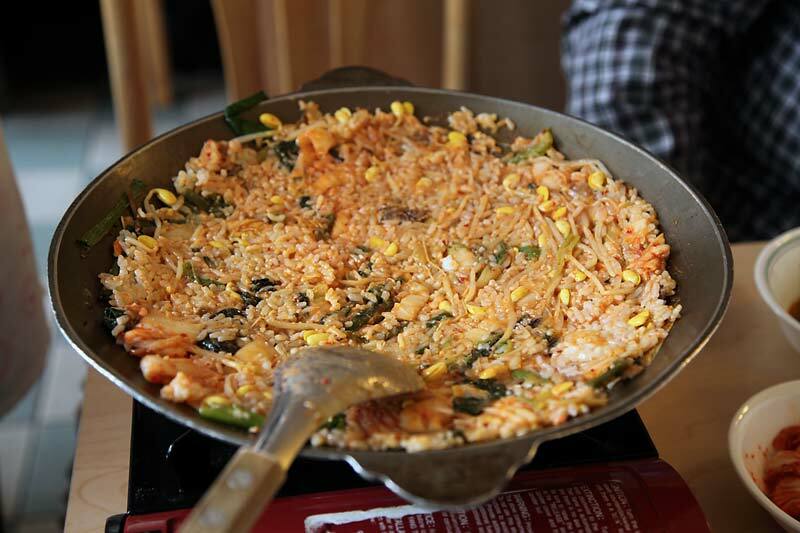 TonyC wrote: the above mixed-in cabbage kimchee essentially turned the yung sul into a very hearty kimchee fried rice. Been to Chun Ju once for Korean Goat stew and was slightly nonplussed, goat meat was mildly assertive, broth loaded with sesame seeds, leaves and scallion, but the overall effect never really came together for me. It may have been the service, our waitress seemed to take particular delight in ignoring us, and by the time she brought the ingredients to make fried rice from residual goat stew juices they were dried and hard. Panchan was plentiful and skate panchan, raw in a spicy Korean hot peppers sauce, was particularly tasty. Since my mediocre goat stew experience I've been a few times, but last week's lunch put Chun Ju back in my Korean restaurant rotation. 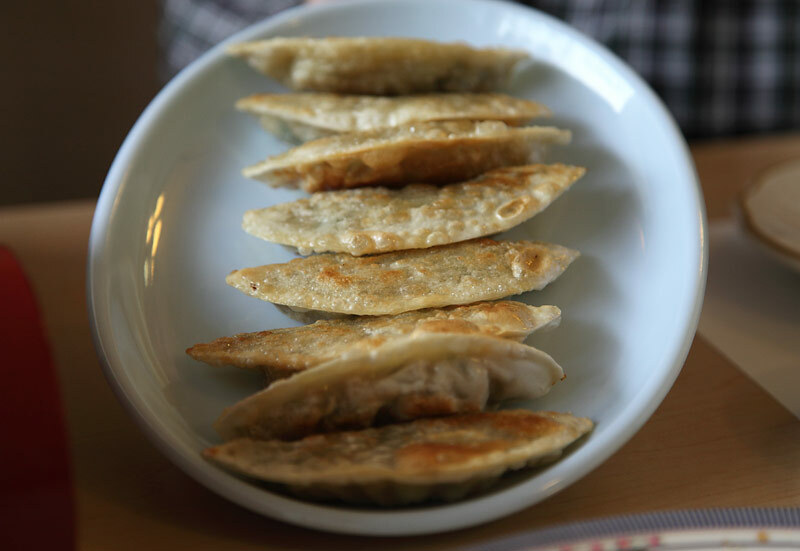 A simple lunch really, light for two hearty eaters, steamed mandu, made in the kitchen bulgogi and beem bob. 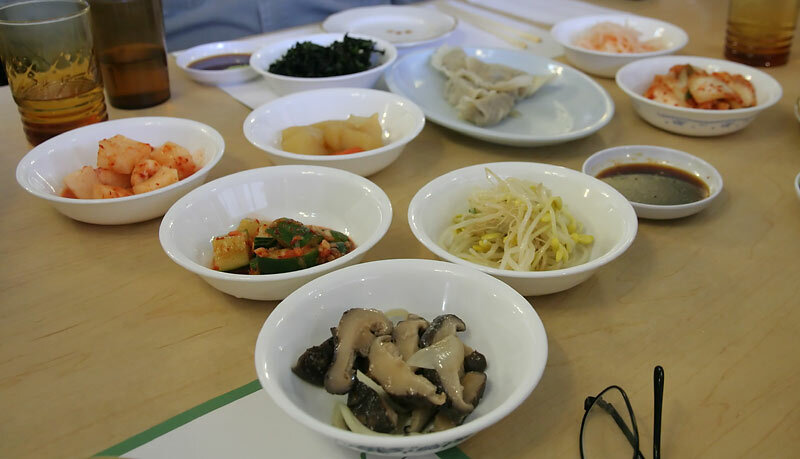 Korean standards, but bright clear flavors made with fresh ingredients and served by a waitress who, even though she did not speak English, seemed to easily anticipate requests before verbalized. TonyC, don't you think this post belongs in a different thread? You know the one: "You know you are an LTH-er when. . . "
TonyC wrote: 2 and a half years later. i finally found out . . .
Glad you are still posting, but. . . no rant? I kinda miss your rant posts. And I mean that affectionately. More often than not lately for lunch, I've been craving Korean Restaurant's (Morton Grove) bibim bop. Refer to GWiv's picture above. It's the metal bowl, the right proportion of veggies & meat, the steaming, perfectly-cooked rice on the side rather than in the bowl, the chili sauce mixed with the fried egg. Oh, and the little individual side dishes of potato/carrot, seaweed, fermented black beans, kim chee, pickled cucumber & bean mung sprouts make it even more satisfying, even better at $7.70 out the door. But don't go by me or Gary. I'd like some LTH'ers to try this (what I think is) traditional bibim bop to get their opinion as well. Among the Koreans, this place is reputed to have the best goat stew in Chicagoland. While they have other solid offerings on the menu, this is what you'll see on most tables when you stop by for dinner. 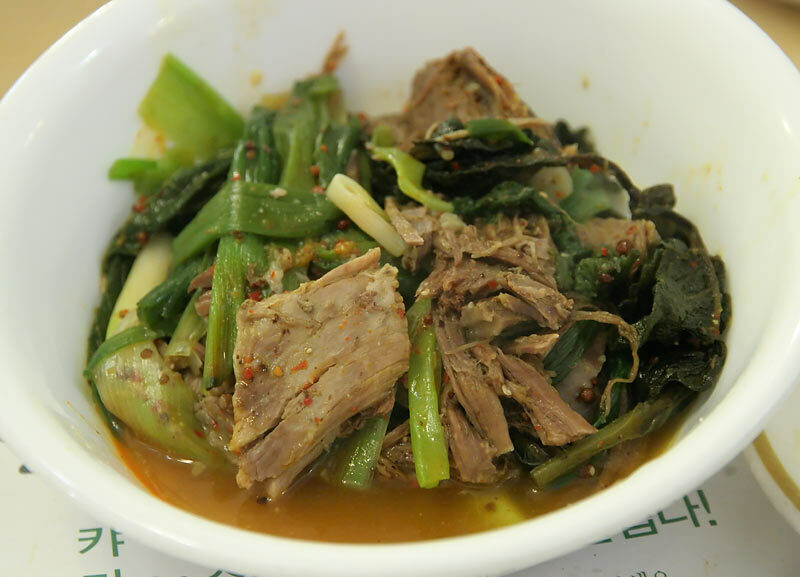 As for the added health benefits of the goat meat and the ingredients themselves... you have to understand that the traditional Korean meal would mostly consist of carbs and vegetables, and fairly lean on fat and protein. For people on such diet, a hefty helping of the latter would certainly result in a surge of 'energy' in one form or another. As for the service, they only have one waitress -- she's been there FOREVER, and she's as efficient and speedy as they come. Cut her a little slack if you find yourself dining there when the house is full. One lunch a week, I'm a slave to Jun Joo and their perfectly proportioned bibim bap. But today, climbing over the snowmounds on Dempster St. in -5 temperatures, something warmer was definitely in order. I decided to try their goat stew, the yung seul bo kum. Pictured basically same as above in the thread, I would say it was magical if I had something to which it could be compared. But to heck with it, it was just damn good. Pot roast-style shards of flavorful goat meat, with scallions, green pepper, onion and Godknowswhat in a fiery burnt orange broth helped by soy and some 'Korean wasabi'. It came to the table bubbling and steamed my reading glasses right from the git-go, and the panchan, always welcome, was a wonderfully cool counterpoint to my quasi-seared tongue. If I find Korean goat stew better than this, can I use the word orgasmic? A quick bibim bap lunch at Korean Restaurant in Morton Grove. I hadn't a bibim bap fix in almost a month, so I was ready. All served with their steaming hot 'corn tea' (that's what the waitress called it), and I was served within 5 minutes of arrival. Tremendous service. This set me back only $7.70 including tax. What a deal! At a freak encounter with Gwiv on Friday morning , I lamented looking for a good Korean spot in the area as a suitable replacement for Ttowa. He heartily endorsed Jeon Joo. We had our inaugural dinner last night. Even though I couldn't convince my wife to eat goat stew, we still made a delightful meal of kalbitang beef soup, steamed dumplings, and Pa Jun scallion pancake. 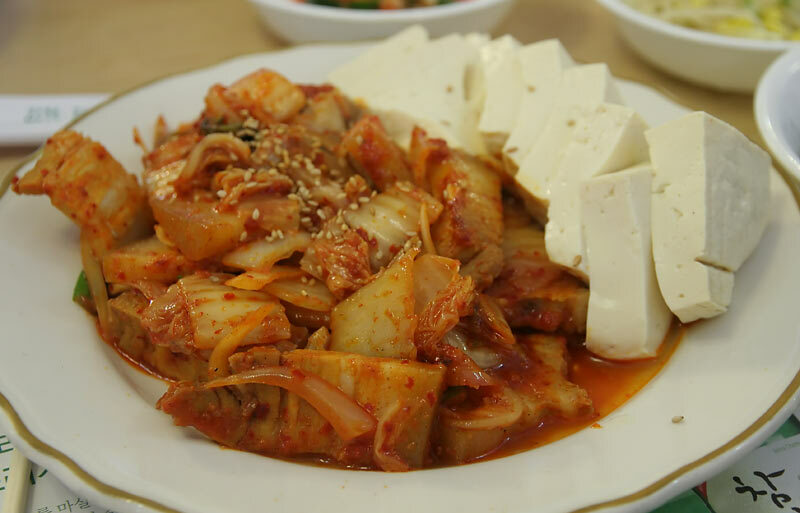 We'll definitley keep Jeon Joo in our dining rotation. Thanks Gary. 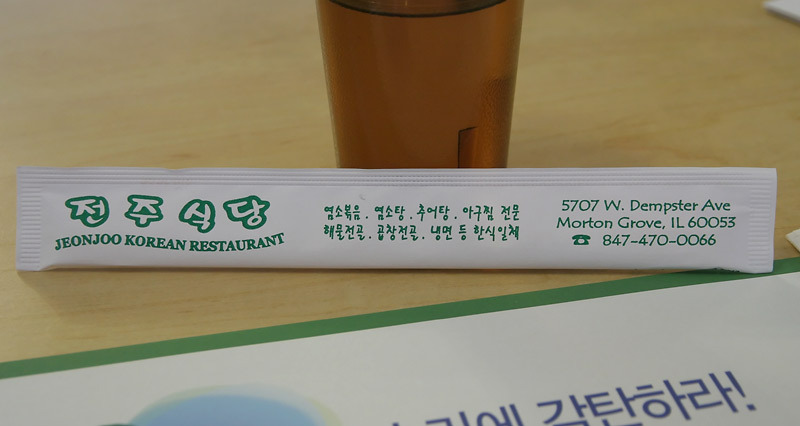 Golden Chopstick, also known as Chun Ju, or Jeonjoo as it's written on their (wooden) chopstick wrapper is best known for goat stew—jeuk suk yum so bok um. The menu suggests it serves two but with a few extra dishes it's plenty for four. Panchan selection is more than adequate but not overwhelming (we forgot to ask for the skate, a supposed highlight). 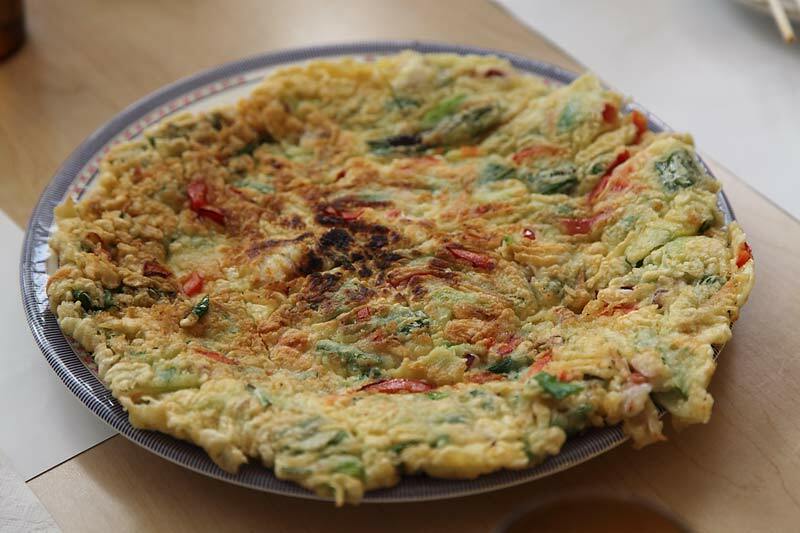 Jeonjoo serves one of the better versions of haemul pajeon, stuffed with seafood. 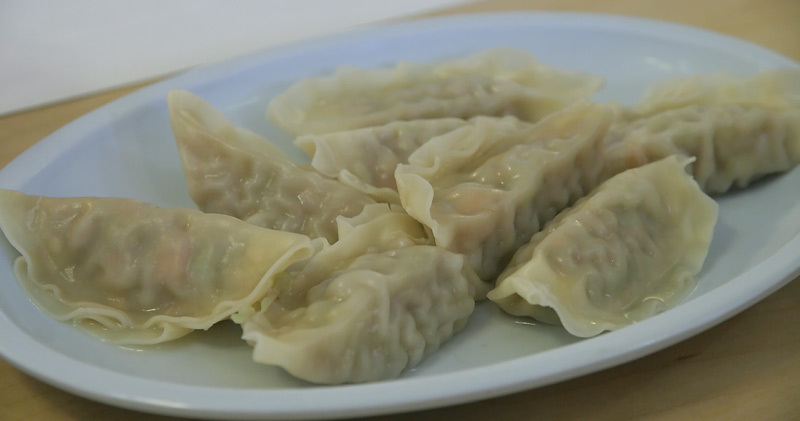 Steamed mandu are ordinary but inoffensive. They have perhaps the worst beer selection imaginable—Miller Lite is the only choice—making it easy to decide on soju. I'm not sure I'm comfortable with someone staring down my gullet as I drink. 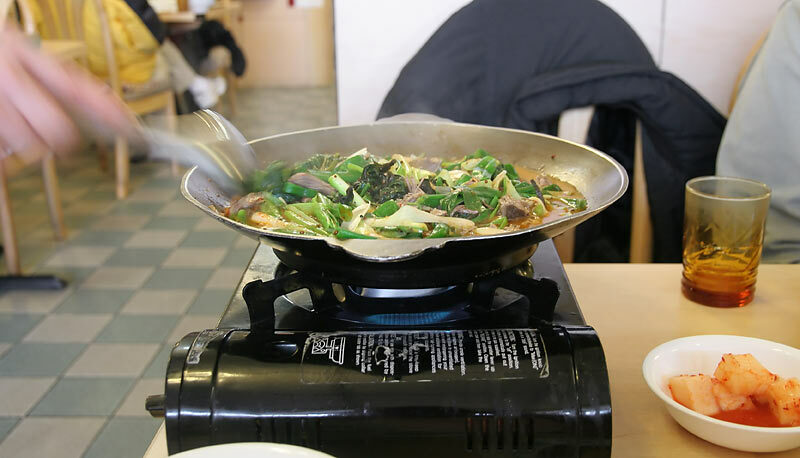 The main event begins when a gas burner and a shallow, thick wok-like pan are brought to the table. 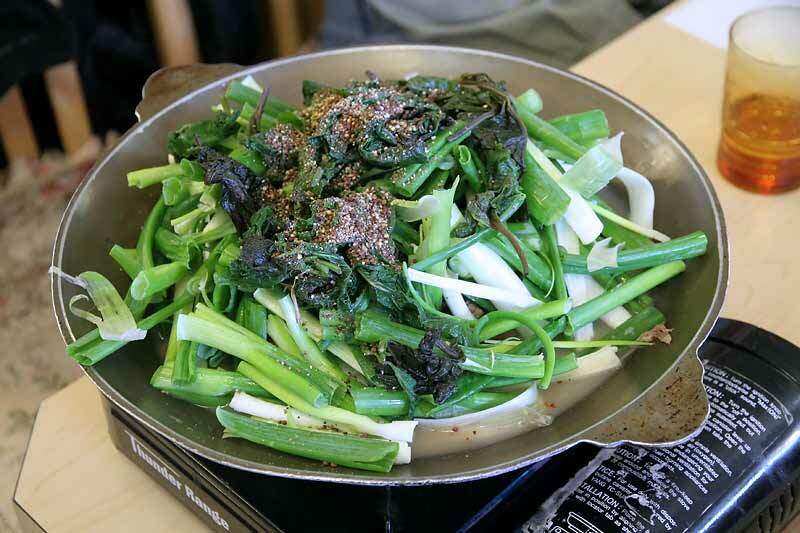 The pan is filled with rich broth, hunks of goat, green onions and perilla leaves and seeds. After bubbling and steaming for five or ten minutes it's ready. Small dishes of soy and wasabi are provided for dipping the goat. 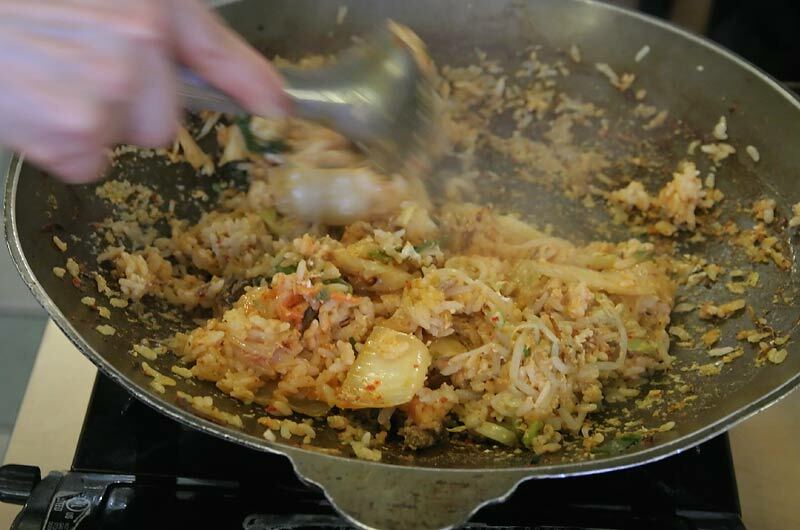 When most of the stew is finished, rice, raw egg, kimchi and soy sprouts are added and the mixture is spread out to cook and crisp up on the bottom. 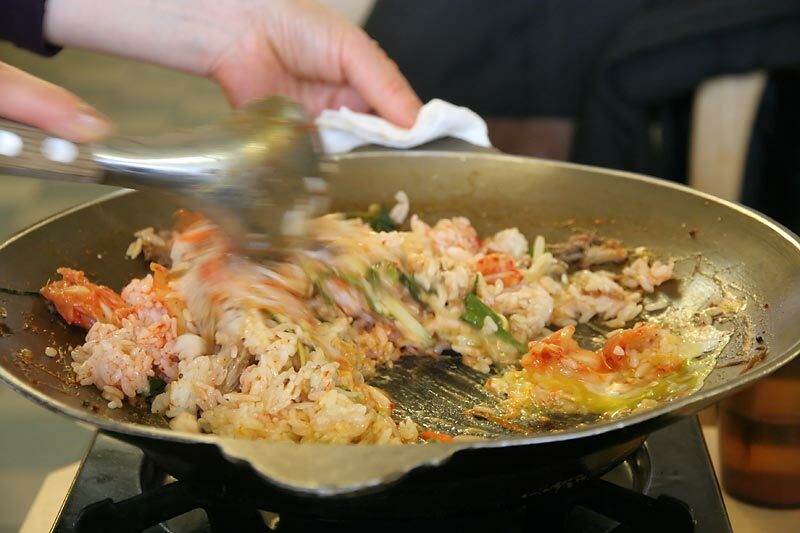 I've had a similar dish only once before, at San Soo Gab San, but much prefer Jeonjoo's version. Rene G wrote: They have perhaps the worst beer selection imaginable—Miller Lite is the only choice—making it easy to decide on soju. I'm not sure I'm comfortable with someone staring down my gullet as I drink. I recently had lunch at the Golden Chopstick and really enjoyed it; especially the Jeuk Suk Yum So Bok Um (Goat Stew). But all the items we ordered were very tasty, including excellent renditions of Steamed Mandoo, Chop Chae, and what I'm pretty sure was Kim Chi To Fu Bok Um . . .
Tender wrappers and moist, ultra-flavorful filling. An outstanding version. As was posted above by Rene G, this was cooked tableside on a portable burner. Judging from the number of burners I saw stacked up in the corner of the restaurant (and the number of them I saw on other tables during our visit), I'd guess this is a very popular item at Jeonjoo. While it simmered away, we enjoyed a few other items. A tasty assortment, although I'll admit to a little panchan envy when I saw what some of the other tables received. Still, considering it was my first visit, I understood. Again, a great version (one of the best I can remember having) with a noticeable depth of flavor. The pork belly was perfect here -- flavorful and tender without being mushy or greasy. Almost ready for service #1. My bowl . . . tremendous, really. Unctuous, tender goat meat and a delectable broth. After most the stew is served, rice, egg and other ingredients are added to the pan. Everything is mixed together with the rice and it's all flattened out in the pan in order to create a crust on the bottom. 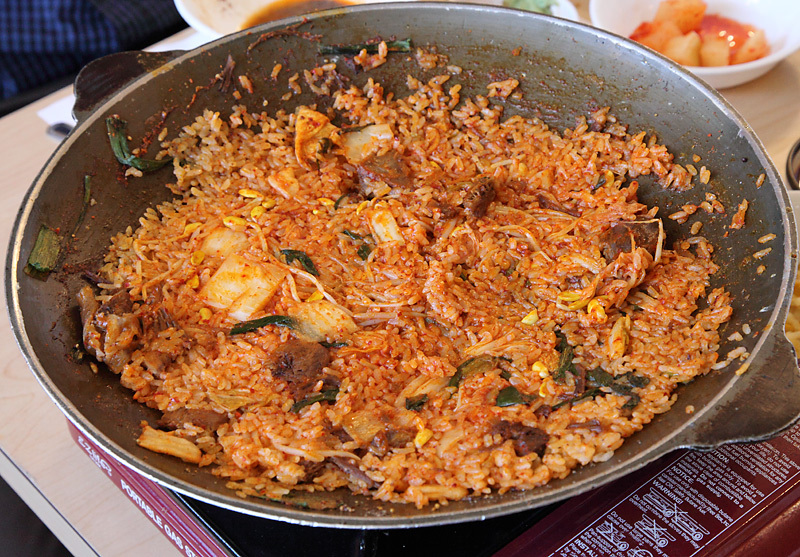 Once the crust develops, the rice is stirred again and then served to everyone at the table. The final bits of crunchy rice are scraped from the pan and placed into my bowl! Thanks, to Pigmon and Trixie Pea, for introducing me to this place, which happens to be just minutes from my new office location. On the night they took me there, I wasn't really able to eat but I made a point of getting back there asap and was very pleased that I did. WOW, Ronnie, I've only had the goat stew as a single, coming out steaming like lava from the back room. Never had Parts 2 & 3! It was my go-to meal on many a Tuesday evening this past winter, the cool panchan a perfect accompaniment. It warmed & satiated me so perfectly, and it was only afterwards that I realized that I had burned my tongue from slurping it when it was still steaming. Had another tasty lunch at Jeonjoo today with a baker's dozen of LTHers . . .
At least one of our 3 tables ordered this and they shared it with our table. It had seafood and vegetables, including scallion. 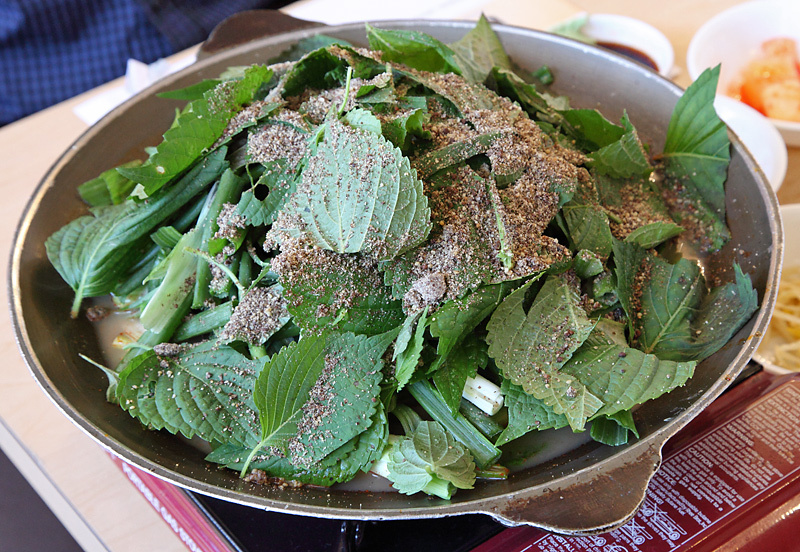 For me, this dish remains the primary reason to visit Jeonjoo. The stew bubbles away on the tabletop burner. While we waited for the stew to finish cooking down, we shared some noodles, which were pleasantly chewy and a bit more substantial than I remember them from previous visits. We also shared some soondubu (which I forgot to get a picture of), which probably wouldn't be worth ordering again. Sweet Willie is locked on that bowl of stew. 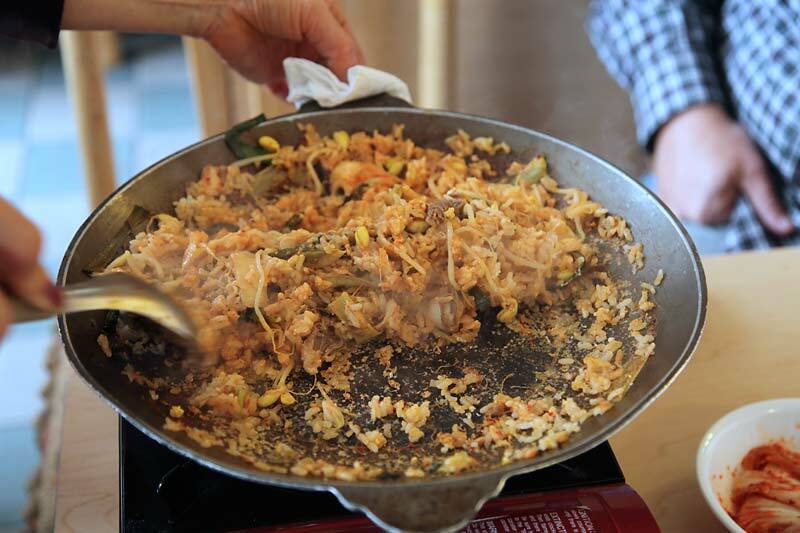 After the stew is served, rice, kimchi, egg and bean sprouts are added. 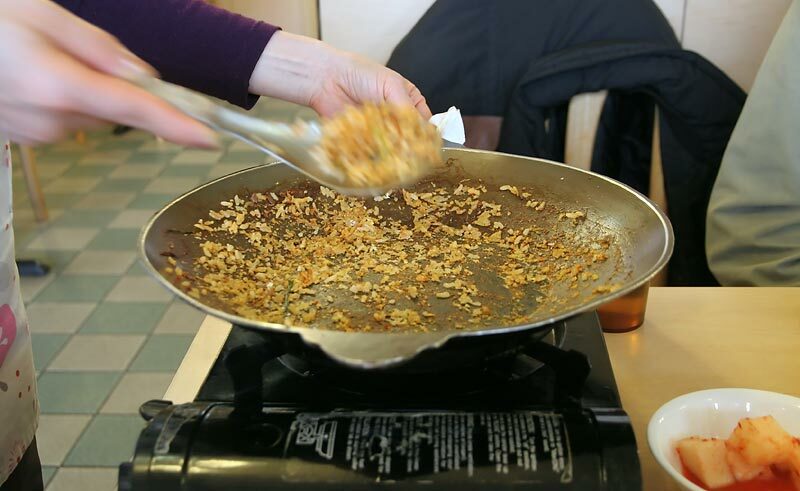 After the mixture is stirred together and all the moisture is absorbed into the rice, it's spread out in an even layer and cooked on high heat. 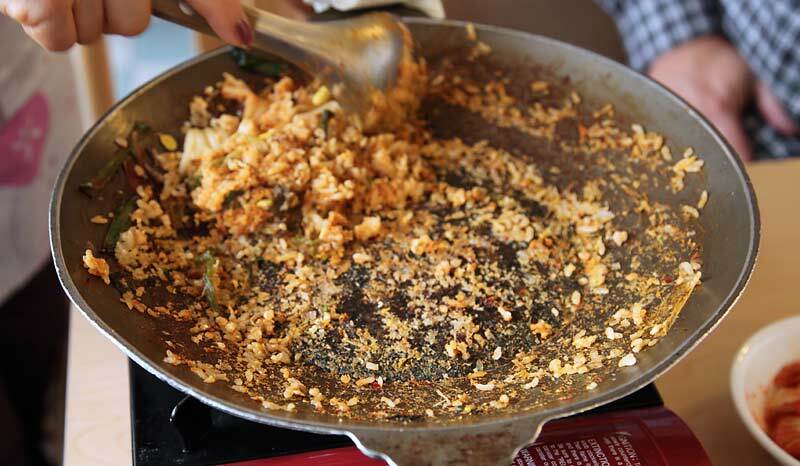 Shortly after the rice begins to crust, most of it is scraped up and served. After most of the rice has been served, the remainer is allowed toast even further and is then served. This is definitely my favorite part. 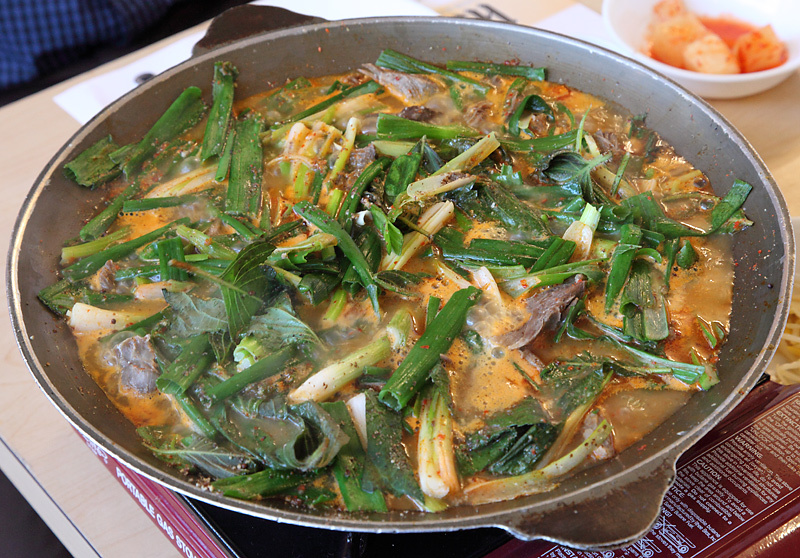 Jeonjoo's goat stew stands out as a 'best in town' type item for me. The other items (with the exception of the soondubu) are all respectable and tasty but the stew is the thing. I've had this at a few other places and in my limited experience, this is the best one I've tasted. I'd love to know about other places in town that make this dish this well. That waitress in the picture is wonderful, the only server I've ever seen in there. 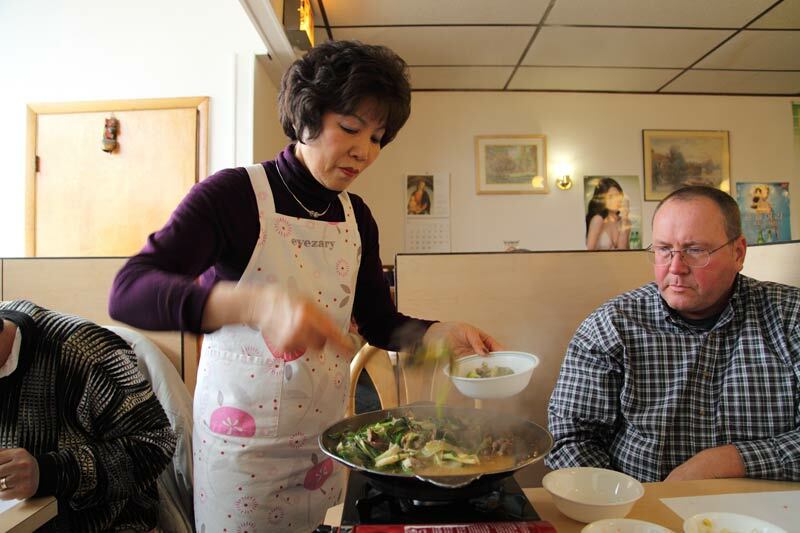 It's truly a mom-and-pop operation, the elderly mom makes magic in the kitchen while pop oversees the operation. They speak very, very limited English but--with great food being the common thread--they are about as nice a couple as you could ever meet. ronnie_suburban wrote: Had another tasty lunch at Jeonjoo today with a baker's dozen of LTHers . . .
ha, yes I was pretty hungry at that point in the meal, at the end I rolled out to my car. Work was not very productive the remainder of the afternoon. The baker's dozen created a bit of a seating issue as the restaurant is not really conducive to larger groups, the group split up to 3 tables. I believe the straight up goat stew was my favorite item of the meal, I was surprised at how much goat there was in the stew as when the pan first arrives, one doesn't see any goat. Meat had the slightly gamey yet sweet flavor I adore with goat meat. I expected to like the crispy rice dish better but I think I was overfed by then. The brown strips are fish cake. 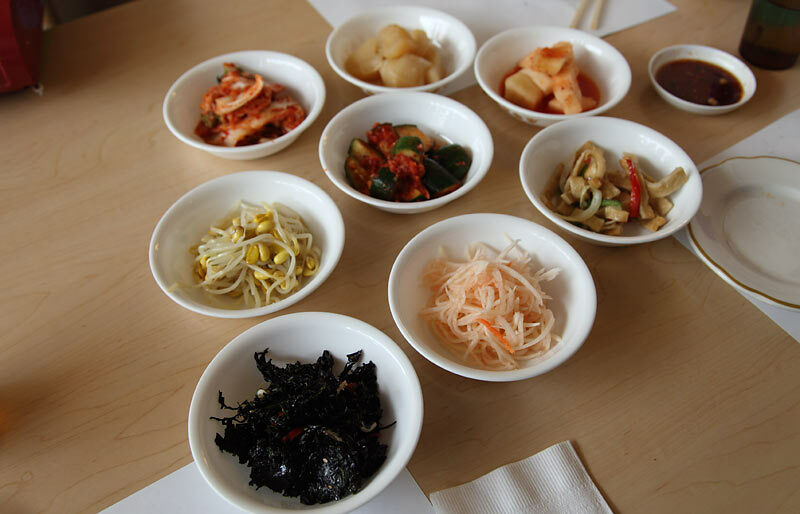 There is a Korean soup called odeng gook that has all kinds of fish cake in different shapes. 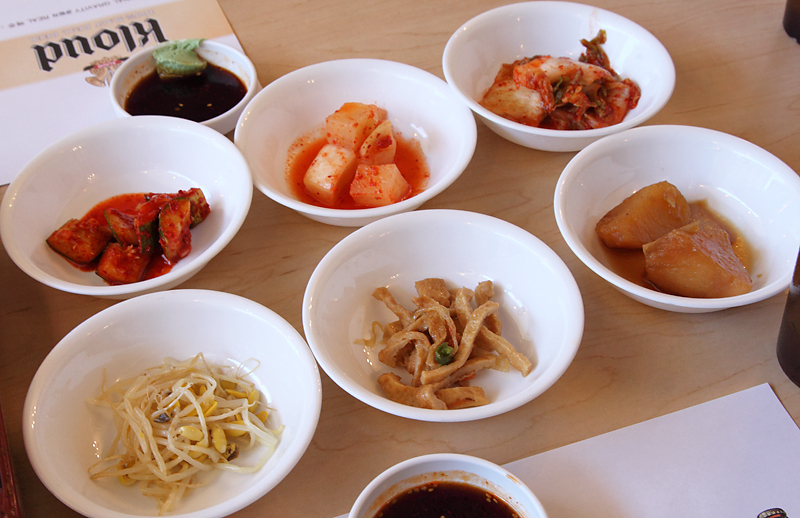 But for the banchan, flat fish cakes are generally used. Thanks, Sharona. You beat me to it (this one I actually knew ). The goat stew is also available in an appetizer portion. It comes to the table bubbling hot. It does miss the pomp and circumstance that comes with the larger offering, though. nr706 wrote: The goat stew is also available in an appetizer portion. It comes to the table bubbling hot. Well, it's a bit more than just pomp and circumstance. Not only is the rice ritual a fairly distinctive offering, it's also a substantial portion of food above and beyond the stew itself. Still, it's nice to know that if you're really hankering for tender, unctuous goat meat -- and you're solo -- pared down, individual portions are available. Also, fwiw, the larger goat stew is listed on the menu as being for 2 (@ $27.95, iirc) but could easily feed 3 or 4, even if no other items were ordered. I wanted to bump this thread after a solid lunch at Jeonjoo today. RAB and I have had the goat stew dinner there a few times over the years, but this was our first lunch visit. 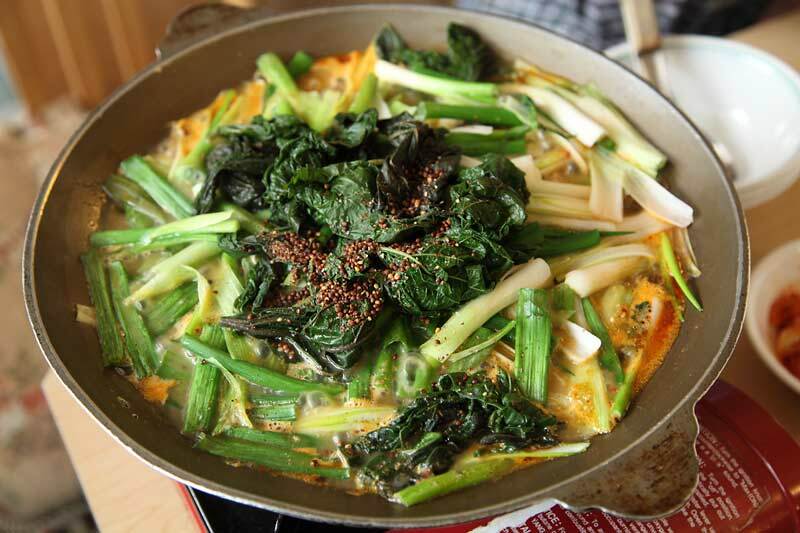 We enjoyed the Yook Gae Jang (beef and veggie soup) and the Soon Tofu Ji Gae (tofu stew). Both were delivered quickly and blazing hot in temperature, as good Korean soups so often are. The beef soup was the spicier of the two, and included bean thread noodles, egg, and loads of green onions. The tofu soup was simple, not much besides the tofu, but it was nicely seasoned and satisfying on a cool, damp fall day. The panchan were largely forgettable, but that didn't matter given how pleased we were with our soups. I've always enjoyed this place and am not sure why it fell off my radar. It's very near my office but I usually tend to eat lunch with a group that's not particularly adventurous, which may have something to do with it. In any case, my lunch mate RAB suggested it today, and I'm so glad he did. It had been way too long . . .
Well, these were just wood. I enjoyed these quite a bit. 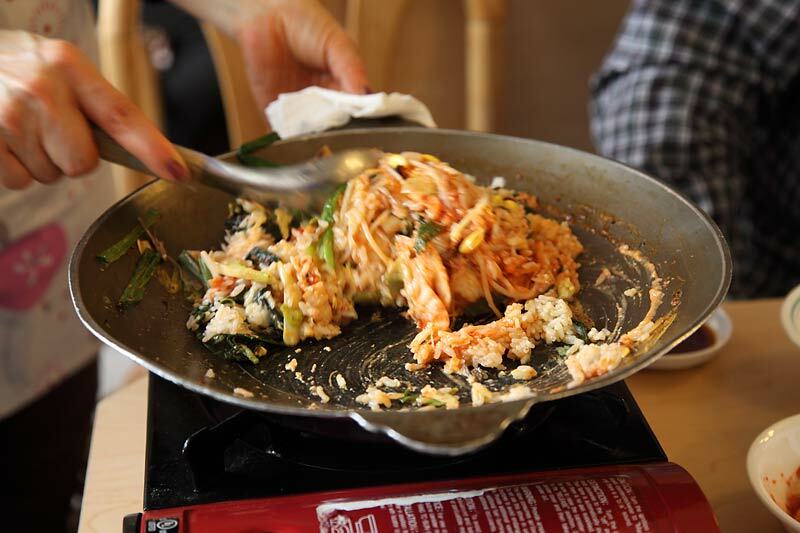 We finished seconds of the kimchi, the kkakdugi and the zucchini. Really nice. 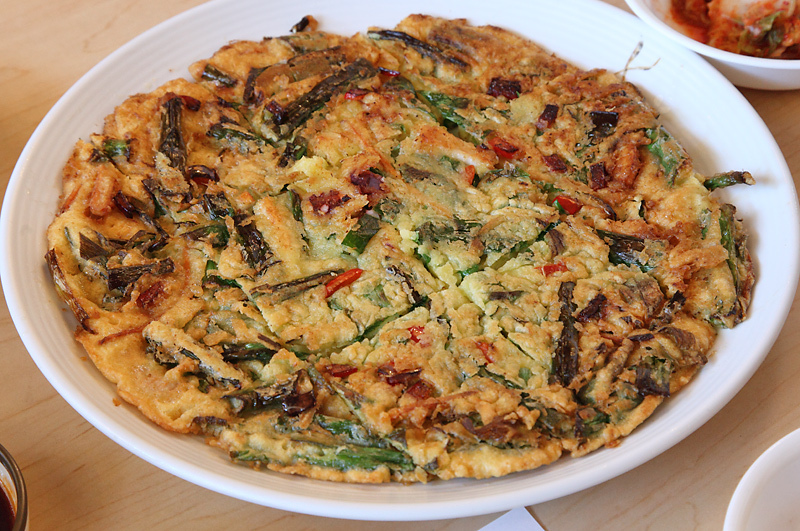 Thin, crispy on the outside and tender on the inside, this tasty pancake contained mostly scallions and other vegetables but also contained some small bits of seafood, including octopus. Goat Soup, the signature dish, just as it started to cook on the tabletop gas burner. Rich and deeply delicious, with a great mixture of textures. I just love this dish, especially when the cold weather starts to set in. You can see the bubbles and steam rising. The fried rice at the end of the rainbow. Hard as it was to not gobble them down, we left behind small amounts of goat, broth and veggies to accompany the rice. 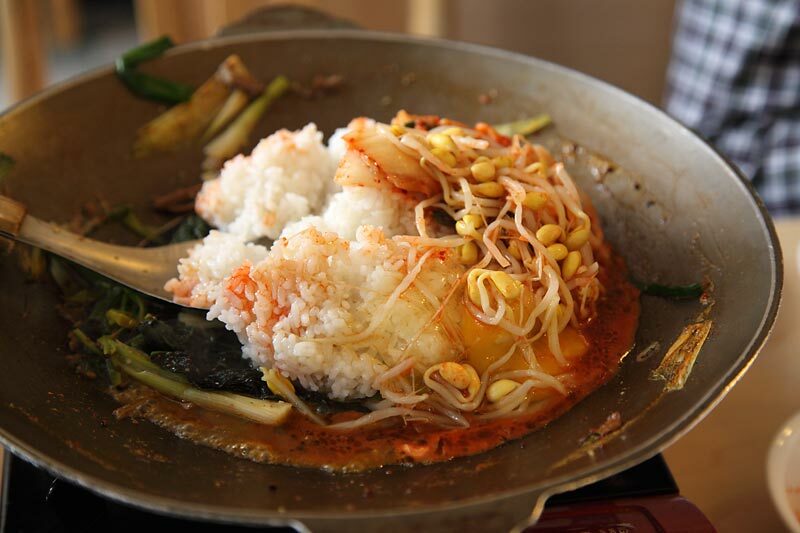 For those not familiar with this, cooked rice, sour kimchi, spicy bean paste, bean sprouts and butter (yes, butter) are dumped into the pan as it gets to the end. Everything is mixed together and the rice is allowed to develop a delicious crust, after which the entire business is happily scraped up and snarfed down. I'm not going to let Jeonju fall off my radar again. It's just too damned good. Dang, Ronnie, I gotta get back there. 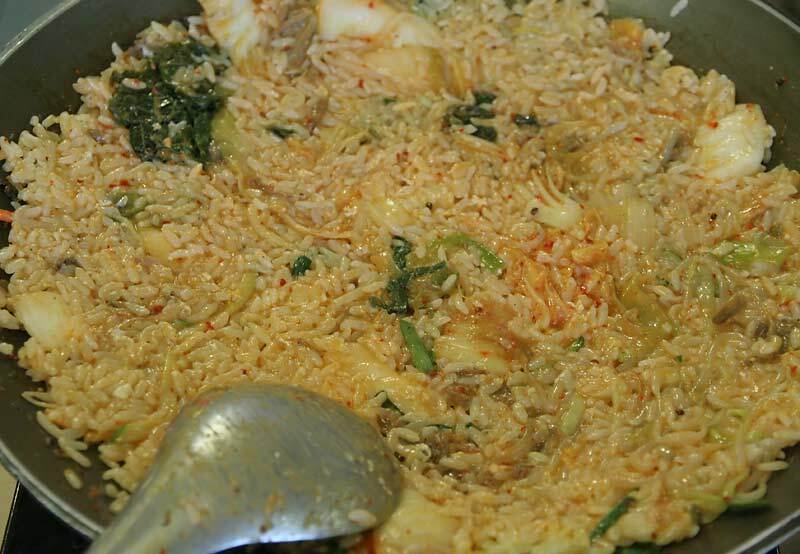 That one-two punch of the goat stew with the perilla leaves/seeds and then the way they turn it into a kimchi, goat, egg fried rice as splendidly pictured is among my favorite Korean foods of all time. Cold weather will bring me back!